You know those movies where someone gets a lodger who turns out to be a real bad egg? It's all great at first. Smiles, a bit of flirting, great meals and even some dish washing. This is the best lodger ever! But then things start to go wrong. Maybe a bit of money or jewellery goes missing. Then your friends and family start turning against you and you do the same to them. By the time you realise how you've been manipulated and controlled, it's too late. Your lodger is running after you with an axe, perhaps declaring their evidently complex understanding of love and demanding you love them back or face the extremely unloving consequences. 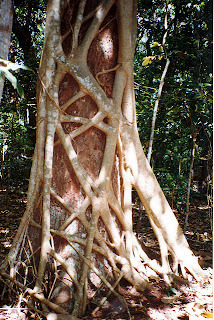 The Strangler Fig is a bit like that, except without the whole "love" bit. They really just want your stuff, which is refreshingly honest and simple. Wait... are you a tree? Probably not. They don't want your stuff, they want a tree's stuff. 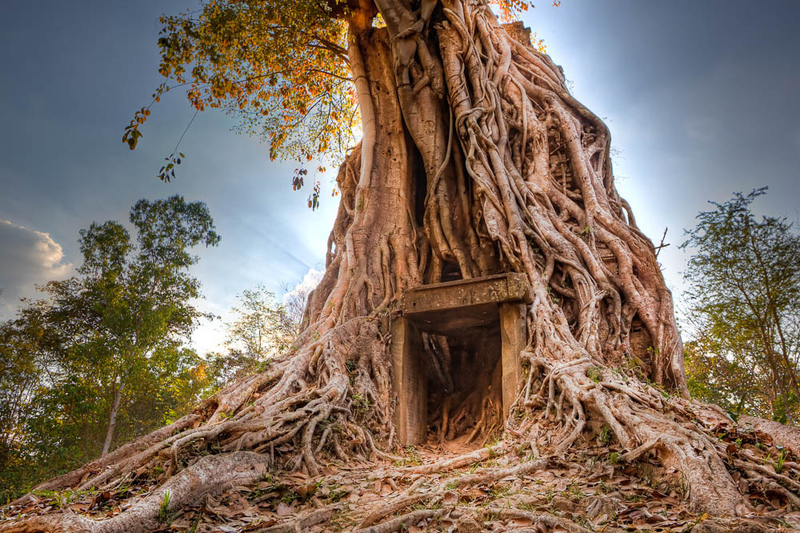 Strangler Figs come from a hostile, barren environment: forests and rainforests. The fruits and foliage that make such places a paradise for so many animals, make it a dark, dry world for a young plant. Their own elders and other competitors take all the light from the sky and moisture from the ground. It's a world of dead man's boots, or dead tree's roots, where the young must wait for the old to die before they can compete to take their place. 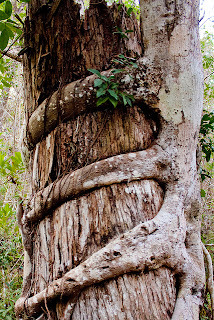 Strangler Figs take a different route. They aren't content to wait for a chance to arise. They take the bull by the horns and... do whatever you're supposed to do when you have a bull by the horns. They're not afraid to get some blood on their hands. Or sap on their.. bark... Let's move on. It starts with a seed, deposited in the faeces of a bird perhaps. But not on the ground. Strangler Figs start life in the nooks and crannies of other trees, half way up the canopy where there is that much more light for the taking. This young plant now grows, both up to the Sun and down to the ground. 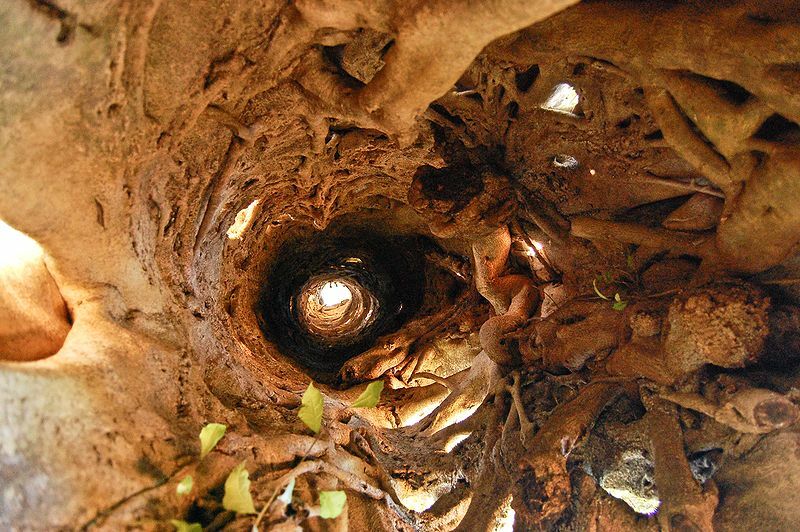 Roots descend all the way to terra firma, like a weird inverse of a borehole. But the Strangler Fig will not be satisfied with supping moisture through a few straws. Innocuous and harmless before now, the lodger begins to unveil its true intentions. The roots begin to thicken. They are long, there are many of them and they completely surround the host tree. In time, they embrace their landlord's trunk. Before long it turns into constriction. Then they start to cut into it. The host tree begins to suffer as less and less nutrients from the soil can make it up to the leaves, the pathways blocked and crushed by the Strangler. More and more nutrients are left in the ground, to be taken up by those same, deadly roots. On the other side, the Strangler Fig continues to grow upwards to the light and steals it away from the host. Over the years the host will sicken and perhaps even die. Eventually it rots away, leaving the Strangler Fig a hollow, complex lattice-work of roots. Grimly beautiful, the Strangler can now remain standing without its host, like a murder frozen in time. Heartless, in more ways than one. 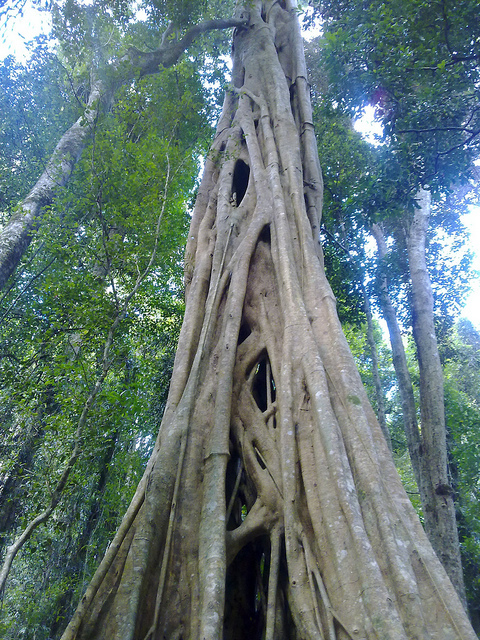 Some Strangler Figs can reach some 45 metres (148 feet) in height and live for hundreds of years. With their dark past behind them, they become important, contributing members of society; their fruits are eaten by huge numbers of animals in the forest and many depend on them. loved your analogy to a bad tenant - flirting, dish washing... ha!!!! Yeh, this is one incredible tree. When you see it, you expect something extraordinary and the life-cycle really doesn't disappoint. I guess I must just really like other people washing the dishes! Even if it's evil, it's really quite a beautiful tree. 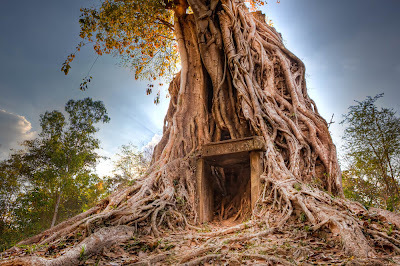 Do you know if a young strangler fig will attack a mature one? Oh yes! They look amazing! I have absolutely no idea if youngsters attack elders. That's a good question and I can't find any information about it. A shame! 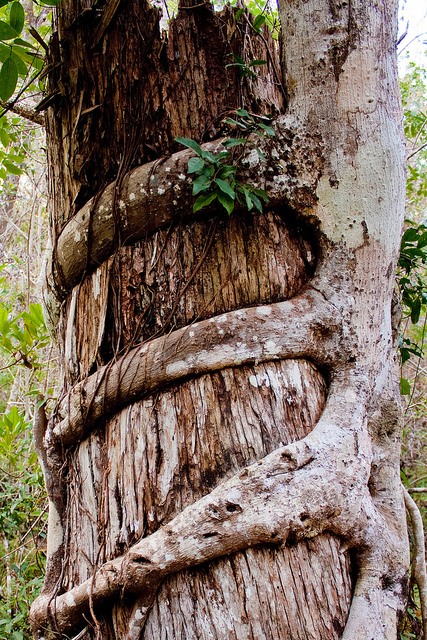 Or how about a strangler fig on a banyan tree, or a mangrove? With a big ol' vine on the outside! It would be the most tangliest plant ever. Blimey, Crunchy! Be careful with thoughts like that, you might just blow your own mind asunder! Oh, I took care of that wiseguy long ago!